Several different clearing procedures for fixed tissue have been developed and utilized. Most clearing reagents differ from protocol to protocol and so does the refractive index. Running a system with different clearing or imaging solutions induces the necessity to correct for different refractive indices. The refractive index compensation of the UltraMicroscope II is utilized via the software interface. The user chooses between current clearing techniques such as CLARITY* or Benzyl Ether. Water can also be selected for in vivo imaging. This technology guarantees the perfect setting for every imaging solution. The UltraMicroscope II is the only light sheet microscope handling organic clearing solutions as well as aqueous buffers. 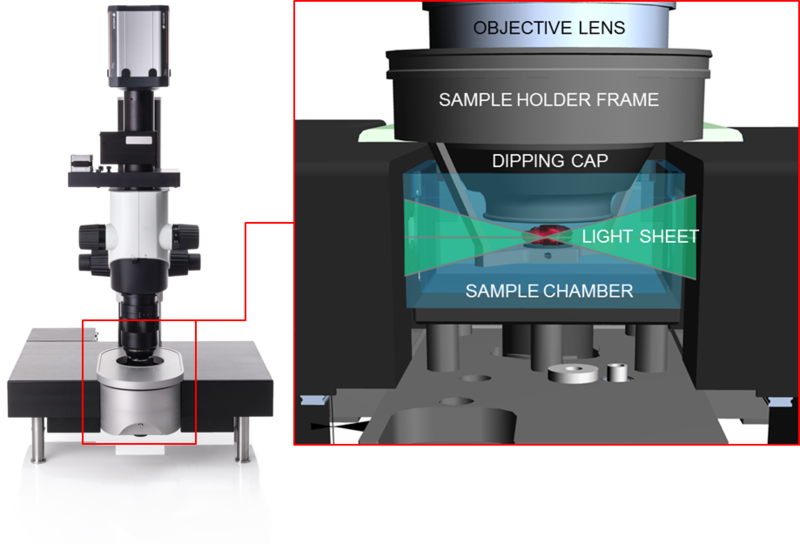 UltraMicroscope imaging chamber with horizontal double-sided excitation and perpendicular detection. 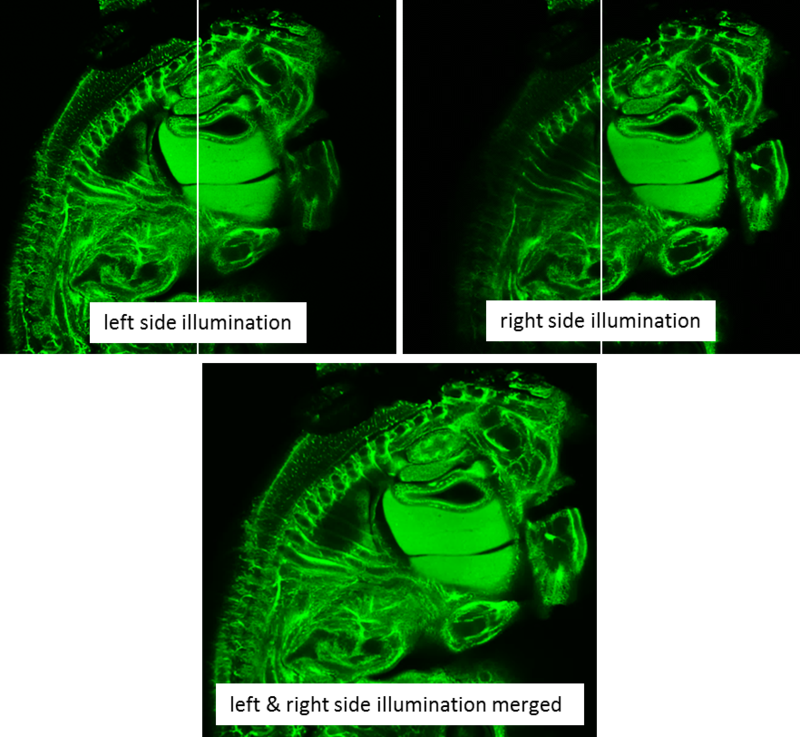 Exciting the fluorescent sample perpendicular to the detection by a focused light sheet offers two major advantages: First, it allows 3D microscopy utilizing a wide field microscope. A camera-based wide field microscope delivers much higher frame rates than any laser scanning microscope. Second, the combination of wide field microscopy and sheet excitation reduces bleaching and photo toxicity significantly. LaVision BioTec’s UltraMicroscope II comes with up to six light sheets that excite the sample from different angles. This means the fluorescence excitation is most homogenous and artifacts like dark areas and stripes are minimized. Double-sided excitation for more homogenous sample illumination. The UltraMicroscope II is the flexible solution for a variety of applications and diverse samples. The UltraMicroscope II has an adjustable light sheet that allows the user to set width, NA and Rayleigh length of the focused light sheets. This unique feature helps to meet the demand for the highest flexibility. The user can choose the perfect matching settings for any kind of sample via the software. In fully automated mode, the software selects the settings. Together with the multi refractive index compensation and the chromatic correction from 400 nm to 800 nm, the UltraMicroscope II can be adapted to different samples and clearing protocols. Custom-made optics form two triple light sheets that are focused into the sample. Z-resolution and contrast is best within the light sheet focus. 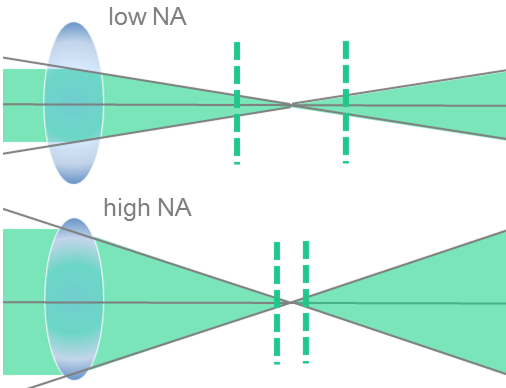 To optimize this, the focus diameter and the focus length [Rayleigh length] can be adapted to the imaging conditions and will be optimized by software. 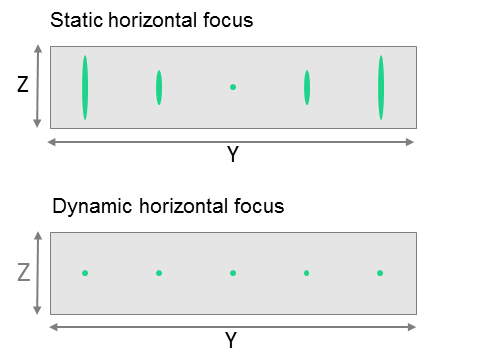 Then, the UltraMicroscope II provides the dynamic horizontal focus that shifts the focus through the sample while imaging. In combination with advanced software algorithms, the UltraMicroscope II delivers pin sharp 3D image of the sample.